Ambulance chiefs face renewed pressure to explain the loss of a key medical record relating to the death of Dr David Kelly after the investigating police force said it had no record of ever having received the document. Dr Michael Powers QC, who is leading a group of doctors campaigning for an inquest into Dr Kelly’s death, accused the Ambulance Trust of trying to shift the blame. At the time of the death, Ms Hunt and her colleague Dave Bartlett, who also attended the scene in woods near Dr Kelly’s home, worked for Oxfordshire Ambulance Trust. 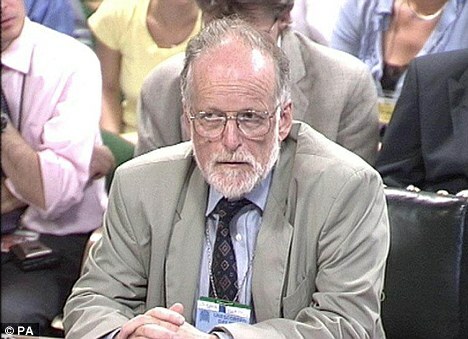 Secret files on the death of Dr David Kelly will be handed over to medical experts to see if the suicide verdict can be challenged. Ministers want independent advice on whether there are any discrepancies or unanswered questions in the post mortem examination report. Home Office pathologist Nicholas Hunt concluded the weapons inspector died after cutting a small artery in his wrist. But a group of doctors campaigning for an inquest into Dr Kelly’s death claim he would not have lost enough blood to end his life. Attorney General Dominic Grieve wants to establish whether they have a solid case. The Mail can reveal the doctors have now begun legal action, calling on Mr Grieve to petition the High Court for an inquest. __(b) (6)_____asked me about something that _(b) (6)_____ told her. There was weaponized anthrax that came to Detrick and then was shipped out and some was missing. I told her I would ask if any situation occurred that led him to say this. I remember the Southern Research issue when they shipped anthrax to California, and it got lost. I think they ended up locating it. PUBLIC health experts have called for an independent body to monitor drug safety after it emerged that young children were more likely to end up in hospital because of side effects from a flu vaccine than they were from the disease itself. The analysis contradicts government safety advice that the harm did not outweigh the risk and raises concerns about the Therapeutic Goods Administration's assessment of the vaccine. More than 1000 adverse responses in children under five were reported to the TGA by June this year, including nearly 100 instances of febrile convulsions, a seizure which in a small number of cases has been associated with long-term adverse health outcomes. The side effects were linked to one of the three seasonal flu vaccines, Fluvax and Fluvax junior, from the drug company CSL, but the TGA maintained despite that, that "the overall risk-benefit balance of both products remains positive". But research published yesterday in the journal Eurosurveillance showed Fluvax might have caused two to three hospital admissions due to seizure for every admission from flu it prevented. The chief executive of the Public Health Association of Australia, Michael Moore, said further examination of risks was needed, at arm's length from the TGA. The government should consider creating an independent centre. "There is a concern … that the TGA is the body that approves vaccines and is also the body that determines what the risks and benefits are when concerns are raised," he said. Peter Collignon, an infectious diseases expert at the Australian National University, said the vaccination program in children under five did more harm than good. "The TGA made that decision [about risk-benefit] without any evidence to back it up." Dr. Meryl says "DUH?!" Panvax only quadruples seizures in kids, while Fluvax increases seizures by a factor of 50. This is supposed to assuage my concerns about Panvax? Why doesn't the Commonwealth tell the public how many healthy children die or become disabled by influenza each year? For the 4 years prior to 2009-10, less than 100 children died each year from influenza in the US, and most were probably chronically ill to start with. Australia's population is about 1/15th of the US. An extrapolation suggests 4 children die each year from flu in Australia, and probably 2 or 3 are chronically ill. How many seizures is it acceptable to cause to prevent 4 deaths? How many other, unidentified vaccine injuries can be caused as acceptable collateral damage? Where is the risk/ benefit balance? EUROPE and the US have banned an Australian-made flu vaccine for young children, after a surge in febrile fits in Australian children. The US Advisory Committee on Immunisation Practices has taken stronger action than Australia's Health Department, by recommending that children younger than nine not be vaccinated with CSL's seasonal flu vaccine. Australian health authorities suspended the use of CSL's seasonal flu vaccine, Fluvax, for the under-fives in April, after it was found to trigger febrile fits at nine times the normal rate. WASHINGTON - Federal law enforcement and national security officials are preparing to seek sweeping new regulations for the Internet, arguing that their ability to wiretap criminal and terrorism suspects is "going dark" as people increasingly communicate online instead of by telephone. Essentially, officials want Congress to require all services that enable communications - including encrypted e-mail transmitters like BlackBerry, social networking Web sites like Facebook and software that allows direct "peer to peer" messaging like Skype - to be technically capable of complying if served with a wiretap order. The mandate would include being able to intercept and unscramble encrypted messages. Although CDC said it would not support mandatory flu vaccinations for healthcare workers (imagine the lawsuits if this were a federal government mandate), various organizations have recently published policy statements* in favor of such mandatory inoculations for all workers in healthcare facilities. What is truly strange about this effort is that you cannot find convincing medical studies that show that vaccinating healthcare workers for flu actually decreases cases, on a statistical basis. Sure, patients come down with flu after being admitted to hospital, and one can cite a death here or there. But no one has shown that vaccinating workers leads to healthier patients or fewer deaths, and the lack of convincing evidence undercuts the scientific and legal basis for mandating healthcare worker vaccinations. Gregory A Poland, MD has authored a large number of papers pushing mandatory flu vaccinations, and has been the prime mover for this initiative since the 1990s. Dr. Greg has been a CDC Advisory Committee on Immunization Practices member, and done vaccine studies for many pharmaceutical firms at Mayo Clinic, where he heads the vaccine research group. He also was hired by the Defense Department in 1999 to go to military bases and promote anthrax vaccinations. After I noted about 20 misstatements in his presentation on anthrax and anthrax vaccine on my website, the talks abruptly ceased. "In Dr. Poland's war, there are no rules of engagement; anything goes." Jacobson RM, Targonski PV, Poland GA. Why is evidence-based medicine so harsh on vaccines? An exploration of the method and its natural biases. Vaccine. 2007 Apr 20;25(16):3165-9. "Vaccines have been hailed as one of the greatest success stories of public health in the 20th century. The 20th century also produced a call for evidence-based medicine (EBM) with applications inclusive of preventive health. Since then, several major EBM analyses have called into question vaccine practices well-accepted by physicians, public health officials, and even the lay public. For example, while counter to existing studies and policies, EBM analyses have concluded that data are lacking to support influenza vaccination of healthcare workers to prevent flu complications among the elderly. In this review, we examine the criticisms and consider the shortcomings in the field of vaccinology as well as in the methodology of evidence-based medicine." Dr. Poland has also disclosed that he has received research grants from Novavax and Merck. Dr. Poland has also disclosed that he has served as a chair for the novel vaccine DMSB for Merck. There will always be people who think they know (or are paid to know) what is best for the rest of us, evidence be damned, and will do their best to coerce us to comply. Most of the know-it-alls in this case have been shown to be compromised by their income from the vaccine industry, and it appears their input was critical in creating the swine flu boondoggle last year. Funny how failure doesn't stop them. * One author reports that he is a consultant for Joint Commission Resources. He and some other authors report various financial relationships with Avianax, BD Diagnostics, Care Fusions, CSL, Cubist, EMD Serono, Emergent BioSolutions, GlaxoSmithKline, Human Genome Sciences, Liquidia Technologies, MedImmune, Merck, Novartis Vaccines and Therapeutics, Novavax, OrthoMcNeil, PaxVax, Pfizer, Rymed Technology, Sage, Sanofi Pasteur, Theraclone Sciences (formally Spaltudaq Corporation), Vaxxinate, and/or Wyeth. This is according to Medscape. We have not declared war against Pakistan, and Congress has not approved making war in Pakistan. Yet we illegally send drones there to kill, and our CIA runs a mercenary army in Pakistan. The American Rule of Law is what took the biggest hit on 9/11. Recently there have been criticisms that BARDA has not spent much of the 6 billion dollars set aside for biological and chemical warfare treatments and preventive strategies after 9/11. In fact, a plan was introduced to transfer some of the monies into other programs. In good bureaucratic fashion, BARDA responded by spending. Emergent BioSolutions, aka Bioport, will be the beneficiary of more largesse from the federal government. BARDA, meanwhile, has demonstrated its commitment to develop a next-generation, recombinant anthrax vaccine despite earlier failures and many millions down the drain in this pursuit during the past ten years. Here is the agency announcement. Preexisting antibodies were common in the elderly: present in 88% of those aged 90-99, present in 27% of those aged 79, and present in 4-5% in those younger than 60. Six studies from Canada consistently found that prior year vaccination in 2008/09 for seasonal influenza was associated with a 1.4- to 2.5-fold increased risk for hospitalization for H1N1 infection, said Naveed Z. Janjua, MD, also from the British Columbia Centre for Disease Control. "As for the mechanism behind those differences, studies in swine suggest that a vaccine that induces "nonneutralizing or subneutralizing concentrations of antibody can enhance the infection rather than protect from that infection," Dr. Janjua said. Dr. Skowronski acknowledged the limitations of case–controlled studies. She suggested that the Canadian findings might be more rigorous than similar studies from the United States and Mexico that reached different conclusions on the effect of vaccination for seasonal influenza on H1N1 infection. Good immunization records and the use of a single brand of vaccine within a geographic region also are factors contributing to the rigor of the Canadian analysis, she pointed out. The studies were conducted with funding from various Canadian government agencies. None of the presenters disclosed no relevant financial relationships." Holt, along with a handful of other legislators, had sent a letter to the GAO in May requesting an investigation into the FBI’s handling of the case. The FBI officially closed the case in February after concluding in 2008 that Dr. Bruce Ivins, a former biodefense scientist, was the sole culprit in the attacks. “In the wake of the bungled FBI investigation, all of us — but especially the families of the victims of the anthrax attacks — deserve credible answers about how the attacks happened and whether the case is really closed,” Holt said in a statement yesterday. Holt has charged in the past that the FBI investigation failed to address basic questions including Ivins’ motive and his connections with the local area. The GAO’s investigation will look to address a handful of specific questions as requested by Holt. However, officials with the GAO, in accepting Holt’s request for an inquiry, admitted that its efforts may be hampered by lack of access to classified material. “Please know that we may encounter challenges to our access to sensitive and classified information from the FBI and the intelligence agencies,” Ralph Dawn Jr., managing director of congressional relations for the GAO, said in a letter to Holt last month. FBI used to determine who mailed deadly anthrax-laced letters in 2001.
of losing support for its anthrax vaccine program. a federal grand jury prepared to indict him for the anthrax mailings. the NAS reaches its conclusions, which is expected later this year. The GAO letter to Rush Holt is here. Children, which the 2009 H1N1 pandemic infection appeared to disproportionately affect, were not associated with more hospital admission or pneumonia cases when compared with seasonal H1N1 or H3N2, said the study. Within thirty days of infection, six out of 395 children with the 2009 H1N1 virus, or 1.5 percent, were admitted to hospital, compared to five of 135 with seasonal H1N1 (3.7 percent) and eight of 255 with the H3N2 virus (3.1 percent). For adults six out of 150 with 2009 H1N1 or 4.0 percent went to hospital, compared to 17 out of 377 cases of H3N2, or 4.5 percent. "Our results suggest that the clinical manifestations and risk of hospital admission are similar for 2009 H1N1 and other seasonal influenza A strains," said the study's authors. "The perceived severity of symptoms and risk of serious outcomes (pneumonia or hospital admission) were not increased," they added. According to Finland's YLE, The narcolepsy rate appears to be at least ten times normal after swine flu vaccination, and may be higher still given the narrow age range of 5 to 15 years reported from Finland. On average, 3 cases are diagnosed in Finland annually, but 12-14 cases have been detected there with onset between last December and February. What other neurological (or other types of) disorders might also be occurring as a result of last year's flu vaccines? It is relatively easy to identify increased rates of rare but extremely serious diseases, especially when the rate may have spiked ten-fold. It is much harder to identify increased rates of more common or less severe diseases that may result after vaccinations. What epidemiological efforts are being made to do so? We may think we can relax and influenza is no longer a problem. I want to assure you that that is not the case," said Webster, chairman of the virology and molecular biology department at St. Jude Children's Research Hospital in Memphis, Tennessee. Webster predicted that the next pandemic could be sparked by a virus that spreads from water fowl to pigs and then onto humans — such as the H5N1 strain of bird flu, which has killed 300 people over the past seven years. He noted that after several years of decline, the number of bird flu cases in humans increased in 2009, lifted by an uptick of cases in Egypt.